This weekend while NASCAR was at Watkins Glen for the 2nd of it's two road course races on it's calendar, I was far over on the West Coast having my own experience with stock cars on a road course. I was a hot, sunny afternoon at Portland International Raceway and I had gone to attend the Big Northwest Subaru meet. As a big Subaru fan I couldn't pass up the opportunity to check out one of the biggest Subaru meets on the West Coast. There was plenty to see from rally cars to time attack cars and everything else including crazy show cars with booming sounds systems. The parking lot had been set up into an autocross course which had plenty of tire-screeching and traffic cone crushing action going on. I stayed for a bit watching as BRZs and WRXs tackled the course navigating through the maze of orange cones. Soon my attention shifted towards the activity going on at the other side of the track. Across the track in the main paddock, the Cascade Sports Car Club was having it's annual Dash for Kids races to benefit a local children's hospital. The main paddock was filled with a great variety of cars from various SCCA classes getting ready to run. I decided to abandon the Subie fest and scurried over the pedestrian bridge over the front straight to the main paddock. There was everything from race prepped BMW E30s and spec Miatas to big GT1 cars and stock cars rumbling around. I wandered around snapping pictures and admiring the different cars in the paddock till I came up the the pre grid where I noticed three rows of cars lined up at the end of pit lane. I also noticed a crowd of people standing around and anxiously waiting. Most of them with crash helmets on and a few with full racing overalls. Most of them seemed to be kids with a few teens and adults in the crowd. My curiosity grew and I walked closer. As I approached I noticed a sign that explained they were offering ride alongs in race cars and there were different options to choose from. My pulse suddenly got stronger. For $10 you could go for a few laps in a spec Miata or BMW E30. For $25 you could ride in a supercar which included a few Porsches, a Corvette C6, a pair of Ford GTs, a Nissan GT-R, and an Acura NSX you could choose from. The final option was a ride in a full blown stock car race car from GASS(Great American Stockcar Series). 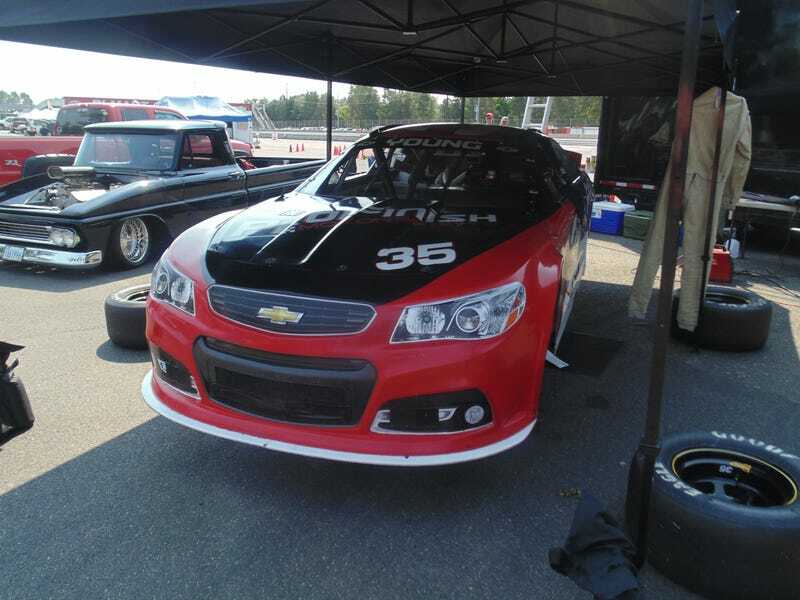 These cars are a sort of a mix between a late model and a more serious stock car such as an ARCA or NASCAR K&N Pro car. These cars are designed to race on short tracks and road course and are actually manufactured locally by a fabrication company in Portland. I decided to go all out and shelled out $50 for a ride in one of these beasts. The fact that this was benefiting a children's hospital justified this unexpected expense in my mind. I was directed over to a tent where I was handed a firesuit, crash helmet, head sock, gloves, and even a HANS device. Things suddenly got a lot more serious. I slipped on my gear and zipped up my suit all the way. The temperature was just north of 80° F so I quickly started to get sweaty with my gear on. The nervousness from realizing what was about to happen certainly contributed to sweating too. After waiting for about 10 minutes I looked over to see three stock cars thundering down the pitlane. One of them would be my ride. The cars squealed to a stop and killed the engines. crew members swarmed the cars and unlatched the safety nets and seat harnesses then helped the passengers climb out of the cars(stock cars don't have opening doors). As the passengers got out I saw the huge smiles on their faces. They had obviously just had felt an immense rush. Now it was my turn finally. A crew member signaled for me to come over and climb in. Now I had seen NASCAR drivers climb into their cars plenty of times on TV but it is a bit of a challenge especially with a bulky helmet on. I ungraciously managed to slide in the passenger seat and suddenly realize just how cramped it was inside a race car. The seat was mounted low in the car and surrounded you quite snugly. I got strapped in and tightened by one of the crew members. "If it ain't tight then it ain't right" he said as he finished the belts and latched on the window safety net. I shook hands and greeted my driver for this ride. Bob Moline, driver of the #90 Ford Fusion. The car is a Ford in name only as all cars are mechanically identical. I took comfort in finding out Bob has been racing for three years in this series and is actually a driving instructor for the series. He tells me that if at any time I feel the need to chicken out of this ride I can just waive my hands to have him slow down and return to the pits. I thought to myself "who would want to miss out on the ride of a lifetime?". I would quickly find out I was not as brave as I imagined. A crew member standing in front of the car gives a thumbs up signal and Bob fires the engine up. The car literally shakes to life as I am reminded this is a purpose built racing machine and not a luxury car meant to be comfortable. Bob selects first gear and disengages the clutch as the car violently jolts forward. This is not meant to be a user friendly machine. All three cars leave the pits together. They will take us for two laps around the track following each other in a fast but controlled pace. Not passing will be allowed. As we reach the end of pit road Bob guns the throttle. The force of the 450hp V8 crate engine pushes me back into my seat but suddenly Bob is on the brakes for turn 1, a tight left-right chicane. Everything I thought I knew about stock cars and their "less than perfect" brakes and handling theory is suddenly invalidated. We blast out of the chicane and then go into turn 4, a long right hand sweeper. I get my first taste of lateral Gs as we sweep around and suddenly turn the other way for turn 6. My insides feel like they are sloshing around inside me. Perhaps I should have waited till after the ride for that polish dog and curly fries. It's too late for that though. We power down the back straight before braking for turns 9-10, a quick left-right and then right again around turns 11-12 and onto the dragstrip which doubles as the front straight. I can actually feel the car sliding a bit as Bob tries to carry as much speed through the last turn. Now were going down the front stretch and up ahead I see turn 1 quickly approaching. It is the tightest turn on the track but Bob shows no intention of slowing down as we approach. "There is no way we are gonna slow down in time to make turn 1" I think to myself. Just then Bob applies the brakes and the car quickly loses speed. He muscles the car onto the apex, through the chicane, and back on the power again. Now whoever is under the impression that stock cars can't handle on a road course should know that these machines have plenty of stopping and turning capabilities. Yes they may get a hard time for not stopping or turning as good as a GT car and being a few decades behind in technology but these are proper racing machines. We finish up the second lap and pull into the pits. The car comes to a stop and the crew members quickly get to undoing the window net and unstrapping me from the seat. There are more riders waiting and time is limited. As I climb out of the car I notice I'm panting as if I had just sprinted up a flight of stairs. I realized the strain that sustained G forces put on your body and I had only done 2 laps. This goes to show that a certain level of fitness is needed to drive a race car. I headed back over the pit wall and gave back my safety gear(they didn't want the head sock back) as another lucky rider got strapped in. As I walked back down the paddock towards the pedestrian bridge the cars came around again on the track. I watched them thunder down the straight this time with new appreciation for speed. It certainly had been a great day for this car nut.